Always A Place For Innovation In Yogurt packaging. 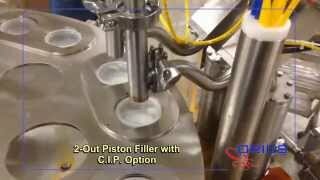 Watch Orics MR-35 Rotary Cup Yogurt Filling Sealing Machine. 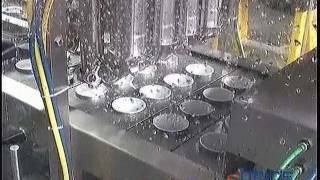 Watch Orics S-50 Yogurt Filling and Sealing Machine. Yogurt is a food celebrity. Not only has the cultured dairy delicacy conquered increasing real estate at retail, in refrigerators and lunch bags, it’s now a double-digit growth category for many food service operations, according to The NPD Group, Port Washington, N.Y.
Now is the time to join this booming category. Consumption of yogurt is up an astounding 400% and there’s still a lot of room for manufacturer’s to profit here with the right innovation. Let us give you some ideas in yogurt packaging. In the wake of the Greek yogurt craze, yogurt remains a superfood with significant upside, according to a recently released report from Packaged Facts, The Yogurt Market and Yogurt Innovation: Greek Yogurt and Beyond. Packaged Facts forecasts that U.S. retail sales of yogurt will approach $9.3 billion by 2017, up from $7.3 billion in 2012. Even with its recent market growth, yogurt continues to be consumed at a much lower per capita rate in the U.S. than in other countries where yogurt is a staple. Moreover, yogurt is spreading beyond the breakfast daypart, reflecting the “breakfast-all-day” culinary and menu trend. In the U.S. market, retail dollar sales of Greek yogurt increased more than 50% in 2012 to reach $1.6 billion, with significant gains in the mass-market as well as natural and specialty retail channels. At the same time, non-Greek yogurt saw its sales decrease. According to David Sprinkle, publisher of Packaged Facts, “Greek yogurt has raised its share of the refrigerated yogurt market to 35%, up from only 1% in 2007.” Even though it is unlikely that Greek yogurt can keep up its growth marathon, Greek yogurt has continued to increase market sales and share through first quarter 2013. Private label controls a large share of the market in refrigerated yogurt, in aggregate ranking as the number two brand overall, with growth outpacing the market. In frozen yogurt, private label ranks as the number one brand, although it is a far less important player in yogurt drinks. The restaurant and foodservice industry also is getting in on the action, with Chobani and Dannon opening up their own yogurt shops, and yogurt appearing on more restaurant menus. The Packaged Facts report also shows how innovative marketers are driving the yogurt and especially Greek yogurt bandwagon into other food categories. Yogurt’s popularity and “healthy halo” have propelled a spill-over over into product categories such as smoothies, frozen yogurt and novelties, cream cheese and butter, salad dressings, dips and spreads, and granola bars, among others. At Orics we will engineer and fabricate your packaging fill and seal machine for any of your dairy or non dairy applications. we will built the machine to suit your plant needs as far as speed filling sealing per minute and as far as space and machine size. we will accommodate you with your every need in packaging filling and sealing machines for cream cheese, smoothie, butter, yogurt, greek yogurt, or salads and fruits fresh from the farm. check our equipment page or just follow us on our you tube channel for best view video clips of our machines and decide whice one fits your needs. Described as “the first application of modified atmosphere packaging technology in a dairy product,” a 6.5-oz whipped cheese product from New Holland, PA-based BC-USA was the subject of a feature story in our February issue of 1995, year two of Packaging World’s existence. Peter Ouwerkerk, Engineering and Development Manager at the subsidiary of France’s Bongrain Soparind Groupe said this at the time: “Some dairy packagers minimize residual oxygen by blowing nitrogen into or across the container to displace oxygen, but they don’t remove it first and then back flush as we do. Now MAP comes to dairy ” A six-up system from [ORICS] was the machine used to fill the package. Thank you for your subscription request. An email confirmation has been sent. Please note that your request may take a few days to process.